Terramite's compact tractor features center mount steering, extended reach arms, dual front curl cylinders, and much more. 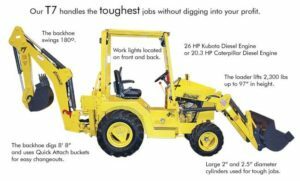 This 2WD, gas powered Terramite compact tractor loader backhoe handles the toughest jobs without digging into your profit. Has extended reach arms for a dump height of 96″, a high capacity front loader bucket for faster cycle time, center mount steering.